The acceleration of technological innovation often makes us feel as though we are losing a race between learning and technology. However, technologies, by changing how we interact with the world, are also, in many ways, facilitating access to lifelong learning for all. It is easier than ever to find the right self-learning resources to arouse our curiosity and learn what we need to know on a daily basis. Knowledge is more available than ever for lifelong learners. They can benefit from peer social network support, lifelong learners like them, who participate in learning communities such as those formed momentarily during MOOCs (Massive Open Online Courses). One of the main strengths of MOOCs is their ability to support self-learning and peer-to-peer learning, which are by far the two most important mechanisms for gaining new skills and promoting lifelong learning. Of course, online learning will never completely replace face-to-face mode, but many of the things we want to know can be learned on the web. And it can be very enjoyable and recreational too. By being connected to other humans and sources of knowledge we keep up to date, we are able to create new connections, solve problems for ourselves and others, and thus become real networked lifelong learners. One of the central objectives of the lifelong learning philosophy is to “unblock” people’s potential. One of the central objectives of the lifelong learning philosophy is to “unblock” people’s potential. This is especially relevant when one considers the willingness of adults to unlearn and relearn, which is sometimes questioned. Do not hesitate, to be or to be again an efficient lifelong learner is not just for geniuses. It is about cultivating attitudes. We all have the ability to learn and change. Our brain has neuroplasticity. It is capable of generating new connections throughout life. At all ages also, technology is a good source of motivation to learn, since the control of learning falls on the person who learns and on the learning process itself, regardless of the age of whom it is addressed. It is crucial to recognize the natural autodidactic potential in each learner and to help people reveal their natural ability to be a self-directed and self-motivated learner. Both Connectivism, the theory of networked learning, and Heutagogy, the theory of self-directed learning, are mainly concerned with self-learning skills. Thus, not only do today’s lifelong learners benefit from new tools, methods, and peers that help them learn at the pace of change, but also their lifelong learning journey is supported by new theoretical models. It has never been a better time to become a lifelong learner. Technology responds to the need for lifelong self-learning for everyone. It makes possible a cultural transformation towards a networked lifelong learning whose benefits are already manifested. Learning, as an inherently social activity, can thrive. The future of education in an uncertain world will depend on individuals and their willingness to take advantage of learning opportunities and invest in their own future. Those well-prepared to embrace lifelong learning will find that their lives improve and their opportunities expand. In an environment that stimulates curiosity, everyone can grow as independent and interdependent learners. Becoming a lifelong learner who invests in LLL skills will not only help you stay ahead of technological change. Lifelong learning will also keep your brain healthy and make you feel more satisfied with life because the desire to learn is a natural characteristic of our species. As educational technology becomes more sophisticated, more available and more attractive, learning can now take place outside of the time and physical limitations of a typical school day. 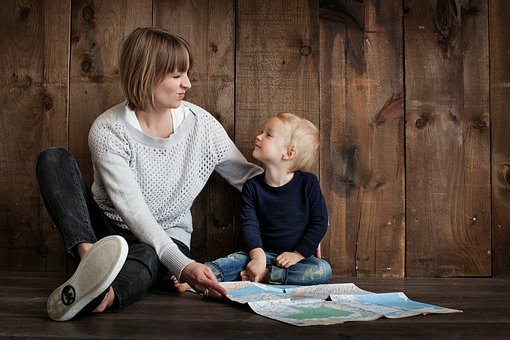 This provides new opportunities for attractive learning experiences outside of school, to connect with the rest of life, which parents can share with their children, as long as they are prepared to do so. There is a world of opportunities that offer ICT and online learning, enabled by the latest technology, that lifelong learner can explore in their daily lives. To exploit this potential, parents need some cyber literacy. It is not about being an expert, but about having a digital readiness that has 3 facets: (1) basic knowledge of digital technology and know-how, (2) ability to turn to social networks for help and guidance whenever necessary, and (3) confidence in one’s ability to find reliable learning tools and information on the Internet. Acquiring a better digital disposition not only allows you to share more meaningful learning experiences at any time with your children, it also serves to find learning resources or information on how to help them with the school. A better understanding of the digital space not only promotes personal, family and intergenerational lifelong learning, it is also essential to keep up with a changing world. 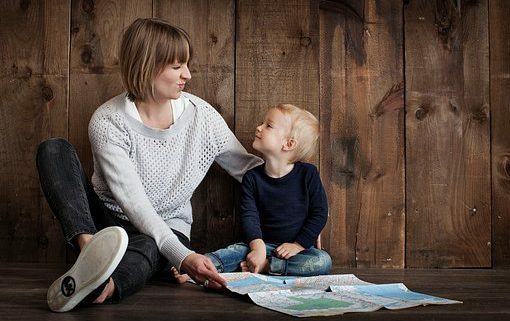 Through learning activities with their parents is how children can better develop social competence, motivation, persistence, and general love of learning. In everyday moments is when the most meaningful learning occurs. 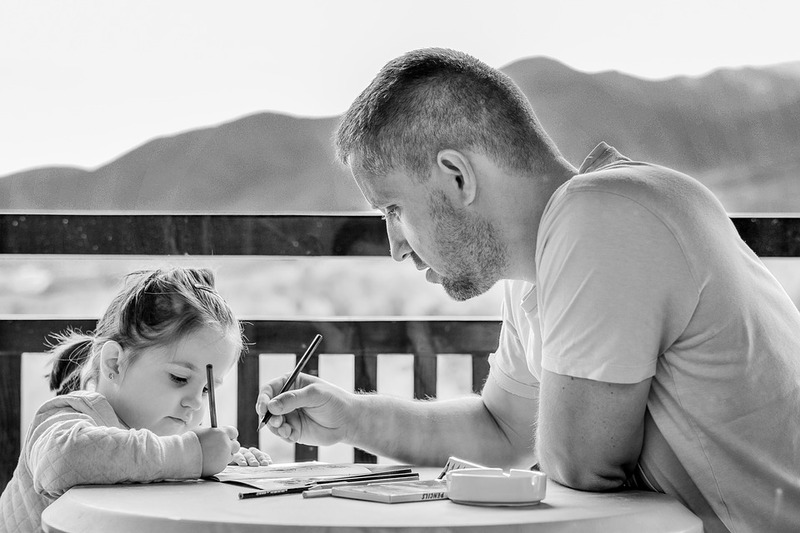 Taking advantage of this indispensable ingredient of time shared with their children is how mothers and fathers can better facilitate their lifelong learning. There are quick and simple ways to incorporate learning into the daily routine. Giving easily shared learning experiences, whether at home or abroad, such as for example at the supermarket. Whether preparing a new recipe, or a field trip, learn out loud. Involve your children. Encourage them to ask questions, to “teach” you new information, to predict what will happen next. Let the children explore on their own and learn from the interaction with their environment. Let them fail. To motivate them, praise them for their effort, not for their intelligence. As one of the most important learning areas that affect all the others is reading, you can organize a space and time to study and read at home. But the most important thing is to stimulate children’s curiosity, taking advantage of every space, moment, experience to marvel at the world and life. Learn optimism. Children are programmed to learn through imitation. They do not imitate blindly: they see our shortcomings and learn from our mistakes. This means that we do not need to do things right, just live at their side and let them observe us. Ideally, therefore, encouraging “lifelong learners” should be through the prime example of parents. Unfortunately, many experienced such significant frustration with formal education as children that they have a tendency to avoid activities related to learning in adult life. When they have children of their own, they often communicate their negative attitudes and thus perpetuate an intergenerational cycle of poor literacy. However, we are all lifelong learner, whether we know it or not. For example when preparing a new recipe or an excursion. Some are more aware of it than others. We live educating and every day provides us with many educational opportunities; to understand this is the greatest favor we can do to our children. In addition, parents need more and more for themselves to be lifelong learners. The desire to serve as learning leaders for their children can also be a motivation to (re)participate in learning. They can discover how it is still a positive experience at any stage of life. A family and intergenerational learning approach can support the development of LLL competencies for all age groups. It allows to overcome the artificial barriers between the home, the school and the community, between all forms of learning – formal, non-formal and informal – and between generations. From here on, spread joy by encouraging lifelong learning in yourself and by talking about it to others. Be an awesome example for your children. Be the lifelong learner you want your child to be. Cultivating the LLL skills is conceiving education as the process of facilitating learning. To do so at school is fundamental, but for this new culture of learning to have a more rapid and profound impact, it must be borne in mind that a child devotes only about 15% of his waking hours to compulsory education within schools. Learning occurs everywhere, not somewhere. You do not learn only in school. The relationships of children with family, friends, places where they are, all the experiences they can live are sources of learning. It is therefore essential to connect the school with the rest of life. It is about creating learning bridges, not only lifelong (with what comes after compulsory education), but also lifewide, with the remaining 85% of waking hours. Potentially, mothers and fathers are the educators who are in the best position to facilitate lifelong learning habits: they can observe, guide, promote and participate in the daily, formal or informal learning of their children at home, at school and in their communities. They are the first and best teachers of their children and can continue to be so throughout their lives. Children learn through their example. But the truth is that many times they do not know what role to take in the education of their children. What main recommendations can they be given to encourage in their children the love of learning that will serve them throughout their lives? First, it is essential to realize that in order to educate, you don’t need a doctorate in education, nor great economic resources, or to give up work, because educating is above all an attitude. It is important to help parents learn about the lifelong learning process, not to transform them into experts on a particular topic. However, there is no expert manual to succeed as educators, a manual that teachers and parents should follow to ensure that children develop in a particular way. Children learn best by accident, when they are exploring for themselves. Different types of children should be given the space to thrive. Alison Gopnik, a child development expert, argues that raising children in the manner of a carpenter with a defined purpose, molding its material into a pre-designed product, will not make children learn. What works is a less directed form of orientation, which allows them to do much of education and development themselves. Children learn when parents, in the manner of a gardener, create a safe, loving environment in which they can flourish freely, where innovation, adaptability, and resilience can thrive. 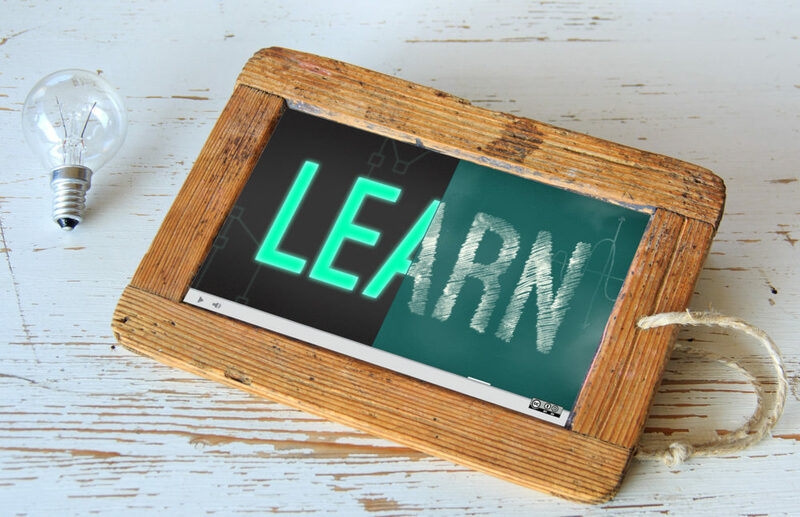 It is essential to realize that lifelong learning is a natural learning process and that it can be self-nurtured, especially in an environment that stimulates curiosity, motivation and the general love of learning. Although the motivation to learn is an innate capacity, formal education can reduce the desire for learning in many children. Why? Because the school system that comes to us from the nineteenth and twentieth centuries is not natural. It was designed at a specific point in history for children to learn a limited set of skills (3R) needed for the industrial age. It is too often assumed that this school of control, focused on the content to be conveyed, represents the way in which an educational system must function, but unfortunately it is not only unnatural and largely demotivating, it is also not adapted to the digital age. 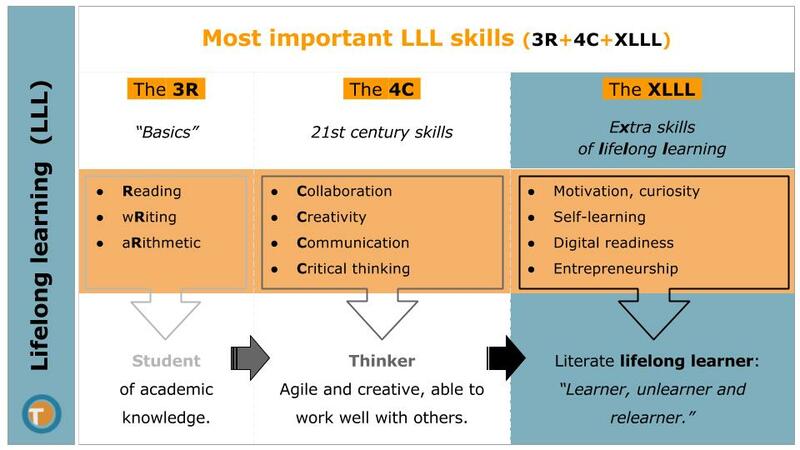 On the other hand, with the Internet revolutionizing our access to content, providing learning resources that allow us to interact with that knowledge more easily, the school has to focus on the learner and the learning process, on the 4C and XLLL skills (eXtra skills of LifeLong Learning; see Figure). Little by little, schools are making the transition to 21st century learning. They stop being places where one is prepared to pass tests, to become environments where the children are empowered. Educational technology is significantly affecting the way children learn and how teachers can lead the lessons. The rows of silent listeners of the past are being replaced by small groups of actively learning students, completely immersed in discussions and explorations. Digital technology is a perfect vehicle to facilitate this. But it is not about learning to use technology or even teaching with technological tools, it is about the students creating and building with technology. What is important is not what is taught, but how one learns and how information is sought. By being interactive and more personalized, learning becomes a more meaningful process. Educational technology makes it easier to be a self-directed lifelong learner, provided we are motivated to do so. Most teaching problems are not so much problems of growth (of how to generate the internal impulse for lifelong learning in children), but of how to cultivate this growth (of how to make this natural impulse develop freely). We are born to learn, not to be taught. The school should not prevent learners from being interested. Its big challenge is to link the things they want to learn with the skills they need to develop. It must become a school of trust, where they want to be, an irresistible learning environment that cultivates the natural motivation for learning. The concept of “lifelong learning” has always existed in the history of mankind but has become vitally important with the emergence of new technologies. It can be defined as the continuous, voluntary and self-motivated search for knowledge for personal or professional reasons. It is not merely an economic imperative, empowering people to stay ahead of technological change. It is fundamentally a learning culture based on emancipatory, humanistic and democratic values. For UNESCO, “lifelong learning for all is a sine qua non for eradicating poverty and hunger. Moreover, informed and active citizens are the key to sustaining peace and democracy.” Promoting lifelong learning opportunities for all, involves meeting the “basic learning needs” of each person, so that s/he can do what s/he needs or wants to do in his life, and to continue learning. This new culture intends to promote learning beyond the school system, throughout the life of the person, from childhood to the end of life. There is no barrier between youth education and adult education. The end of compulsory schooling is not the end of education. Lifelong learning does not begin when you leave school. Moreover, compulsory schooling should first and foremost aim to begin connecting young people with the rest of life—lifelong and lifewide—and with adults. 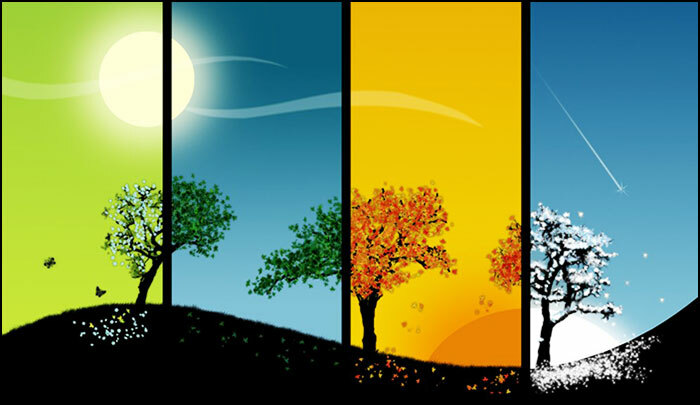 This integration of learning and life, which seeks to create learning opportunities in different environments throughout the life of an individual is one of the most significant developments of our time in the pedagogical plane. Literacy can no longer be perceived and treated as an independent set of skills that develops and is “completed” within a short period of full-time study and then ends. Children who are now starting elementary school will probably live to see the XXII century. How long will they have to work? Until 2075? Difficult to predict. However, in view of the acceleration of technological transformation during the last 20 years, especially with the rise of the Internet, it seems sensible to say that they will need to adapt to a more complex and unpredictable society, where constant change constitutes the new normal. A lifetime job is an unlikely scenario… unless they make of lifelong learning a job! Learning is not just for school but for life. We are heading to the age of experience, which employs the new technology as a servant, not as master, of what is desired. But the Internet is more than a tool. It is an ecology of human-technology interaction, the very water in which we are swimming. It impacts the very way in which we organize, both globally and locally. With half the world’s population already connected (3.5 billion users), a powerful global conversation is under way. 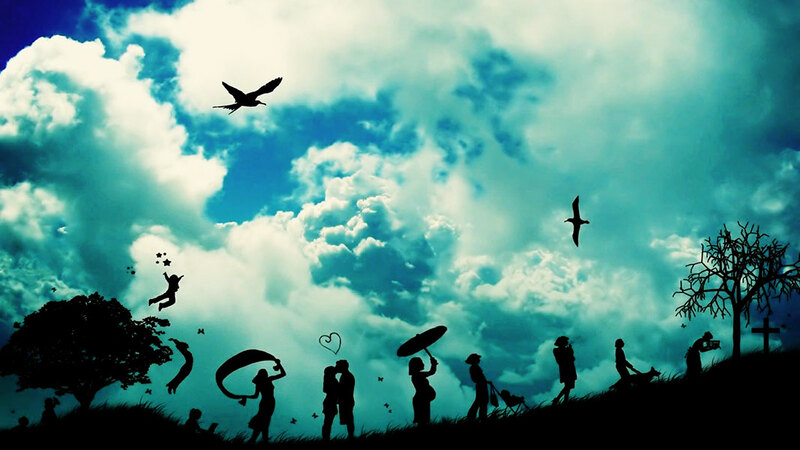 People are discovering new ways of creating and sharing knowledge. This distribution of knowledge adds new layers of complexity to the world we live in, significantly increasing the importance of literacy for citizens compared to the past decades and posing a challenge especially for those with limited basic skills. To adapt to this digital transformation, many organizations are moving from hierarchies to networks, learning for the future. More and more people are self-organizing to address the problems of society on an scale unimaginable before the Internet. The capacity to access collective intelligence is, in fact, the defining transformative phenomenon of the Digital Age. With this change of how we receive and gather information, collaborate with others and communicate, having education, or, in other words, being adapted to the world, is no longer about how much you know, but fundamentally about having the capacity to acquire new knowledge when you need. In the past, education consisted in imparting knowledge. Today, it is about providing students with the skills to navigate in an increasingly unpredictable world. There is a growing need for creativity, flexibility, analysis and synthesis skills in the use of information. The school has to help children understand the networked world as it changes, and educate them for life rather than training them for the jobs that exist now. They should be able to thrive in whatever job they choose. Whether it is a new type of work, an old one or one that uses a new technology, the acceleration of change in almost all important areas of knowledge means that within a few years of initiating it, a gap will be opening up between what they need to know, what has recently been discovered, and what they were taught while at school. Regardless of how good education is, acquired skills quickly become obsolete. The challenge to face is not a “world without work” but a world with a work that changes quickly. That world demands stronger and more continuous connections between education and employment. This is true for both experienced employees and recent graduates. Studies in the United States, Australia, the United Kingdom, France and India have shown that there is a gap between the skills that employers need and the skills that students have when graduating; likewise, the disparity in the distribution of skills is seen as the major driver of inequality in our society. Therefore, the ability to continuously acquire new knowledge and improve your skills through independent lifelong learning is increasingly important, not only for children who are starting school today, but also for those people who left it long ago.